Welcome to Career Watch, a vocational checkup of top actors and directors, and those who hope to get there. In this edition we take on global star Penélope Cruz, who’s delivering lauded performances on multiple platforms, in English and her native Spanish. Bottom Line: Cruz is a Goya and Oscar-winner (“Vicky Cristina Barcelona”) who chases challenging material around the globe. This year she and husband Javier Bardem not only opened Cannes with Asghar Farhadi’s Spanish mystery drama “Everybody Knows” (Focus Features) — which went on to rack up over $6.5 million in France — but Cruz transformed herself into blonde Italian fashion icon Donatella Versace for her first-ever foray into television. Ryan Murphy’s “The Assassination of Gianni Versace: American Crime Story” (FX) scored 18 Emmy nominations last week including Supporting Actress in a Limited series for Cruz. Next, she’ll play her sixth role with mentor Pedro Almodovar, playing his mother in autobiographical drama “Dolor y gloria” along with Antonio Banderas. Career Peaks: The brunette actress has been an international star since her first movie with Almodovar, 1997’s “Live Flesh.” That was followed by “All About My Mother,” and Almodovar’s small-town semi-autobiographical “Volver,” for which she shared the Cannes Best Actress award with the female ensemble, and became the first Spanish actress to earn a Best Actress Oscar nomination. She won the BAFTA and Best Actress Oscar for her warm and witty role opposite Bardem in Woody Allen’s “Vicky Cristina Barcelona.” She also scored an Oscar nod for her supporting performance opposite Daniel Day Lewis in musical “Nine” (2010). Assets: The ballet-trained actress can do anything in three languages: her native Spanish, English, and Italian: comedies (“To Rome with Love,” “Vicky Christina Barcelona,” “Waking Up in Reno”), thrillers (“Gothika,” “Elegy”), westerns (“All the Pretty Horses”), melodramas (“Everybody Knows,” “Twice Born”), tragedies (“Ma Ma”), musicals (“Nine”), big-budget studio pieces (“Spectre, “The Counsellor,” “Pirates of the Caribbean: On Stranger Tides” and “Murder on the Orient Express”), and costume dramas (“The Queen of Spain”). 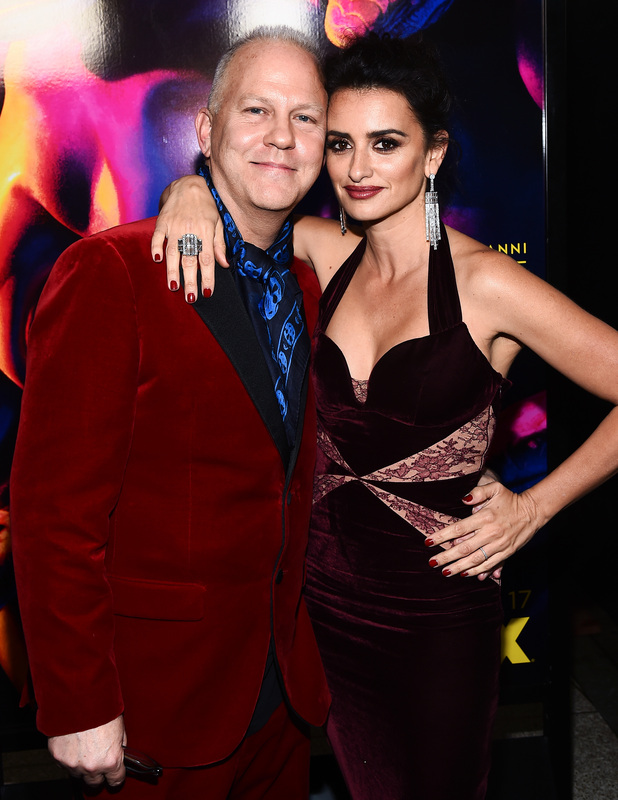 Ryan Murphy and Penélope Cruz at ‘The Assassination of Gianni Versace: American Crime Story’ TV show premiere. Cruz doubts that Donatella has seen the film, but she did send Cruz flowers the day of the premiere, “with a beautiful note to wish me luck,” she said. Next Step: Cruz is currently filming her supporting role in Almodovar’s “Dolor y Gloria.” Banderas plays Almodovar. “Life is funny,” she said. “I’m Antonio’s mother in the part when he’s a little kid. It’s very beautiful. A lot of things are obviously about Pedro, others are more fiction. I think he’d agree this is an homage to his mother.” Coming up is the Simon Kinberg spy thriller “355,” which she helped producer and costar Jessica Chastain to sell to Universal at Cannes, along with Lupita Nyong’o, Marion Cotillard and Bingbing Fan. Also in the works is the Todd Solondz fable “Love Child,” co-starring her “Versace” costar Edgar Ramirez.